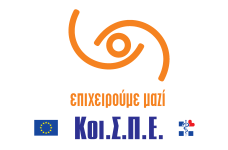 The Social Firms Europe CEFEC, with the cooperation of the Pan-Hellenic Federation of Social Cooperatives (P.O.Koi.S.P.E.) 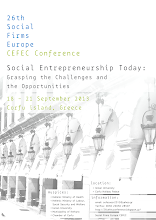 cordially invite you to participate in the 26-th Annual European Conference of Social Firms Europe, CEFEC 2013 on “Social Entrepreneurship Today: Grasping the Challenges and the Opportunities” to be held in Corfu (Kerkyra Island), Greece, from September 18 to September 21st. The conference is under the auspices of the Hellenic Ministry of Health, the Hellenic Ministry of Labour Social Security and Welfare, the Ionian University, the Municipality of Kerkyra and the Chamber of Corfu. The 2013 Annual Conference of Social Firms Europe CEFEC is organized again in Greece after a period of ten years and it will be an excellent opportunity for the international and national community, academics, social economy researchers, market and industry analysts, government officials and policy makers and entrepreneurs to discuss and debate on the topic of social entrepreneurship during the present times, the possibilities and challenges that arise today in this field. The organizing committee of the Conference has been working hard to provide you with a full and interesting agenda for all four days. The Conference programme is a combination of plenary sessions, study visits and a number of attractive interactive workshop sessions. We sincerely hope that you will join us in making the 26-th Annual Conference of Social Firms Europe CEFEC 2013 a true success.